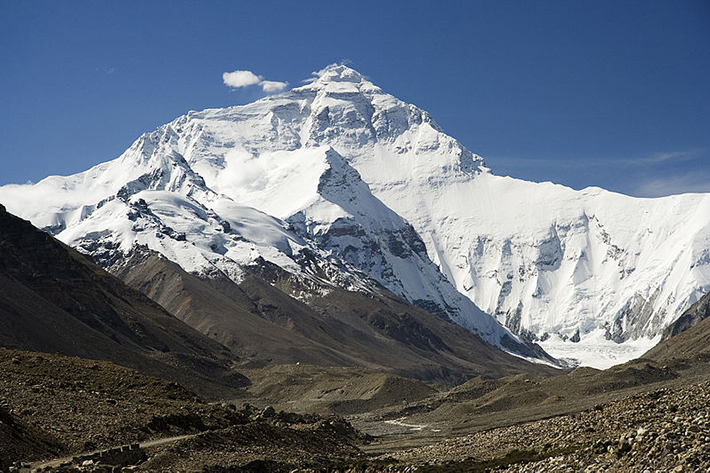 At 29, 029 ft, Mount Everest in Nepal is the highest mountain in the world. Over the years, it has attracted considerable attention from highly experienced mountaineers as well as capable climbers who are willing to hire professional guides. A trip to Mount Everest’s summit costs around $25k to $60k, and if you’re planning to take the climb, be warned, because sometimes, it can also cost you your life. Climbers seeking the summit typically spend a substantial amount of time within the ‘death zone’ (altitudes higher than 26,000 ft), where climbers have to face significant challenges (such as altitude sickness, extreme weather conditions, frostbite, avalanches) to survive the mountain’s higher regions. Unfortunately, not all of them do. 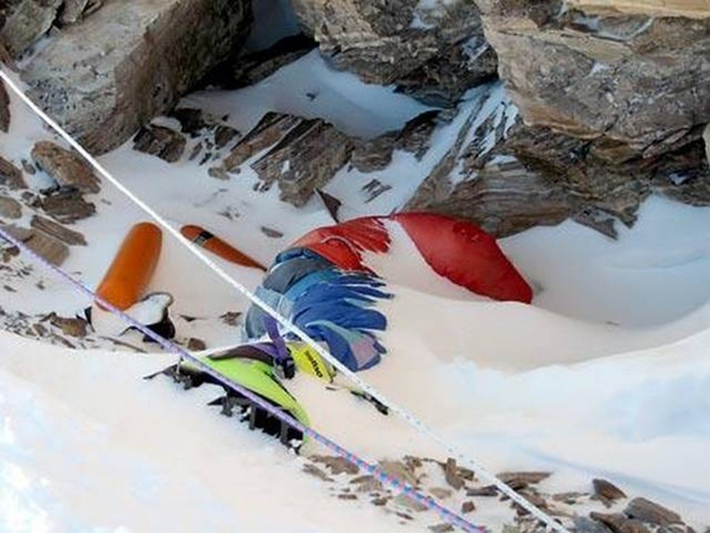 Many climbers have said that the hardest part is neither the dangerous and strenuous ascent nor descent, but is actually the fact that they will be passing nearly 200 dead bodies frozen on the mountain. Below are a few of them. 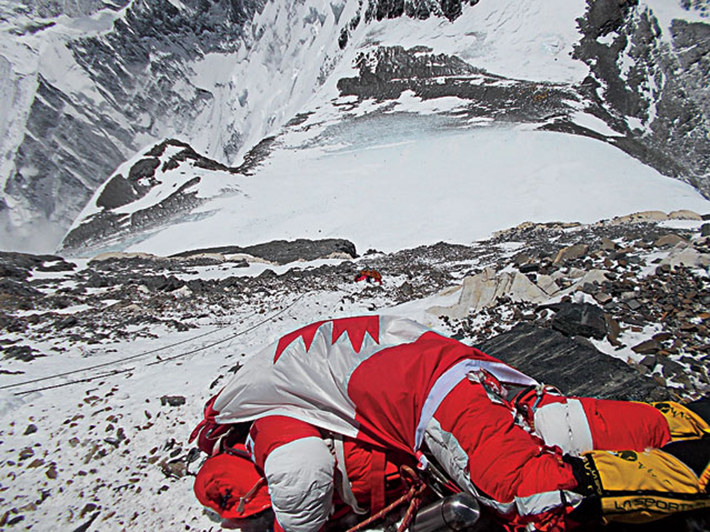 Since it’s nearly impossible to recover a dead body on Mount Everest, several of them have been left there, named, and used as landmarks. Two climbers found a woman alone and dying yelling, “please don’t leave me” but were forced to continue on and let her die as they had no means to help her and staying would risk their own lives. They felt so guilty they spent years saving up enough money to finally return and give her a proper burial. 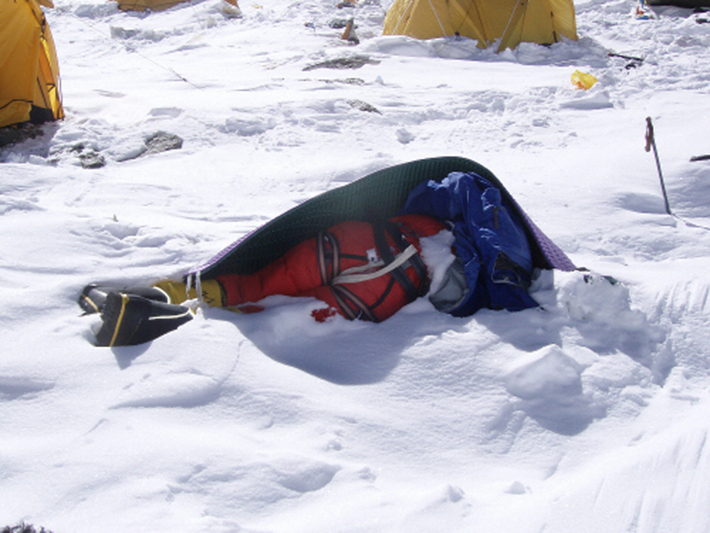 This body has been named “Green Boots”, perhaps the most most well known body on Everest. His real name was Tsewang Paljor. 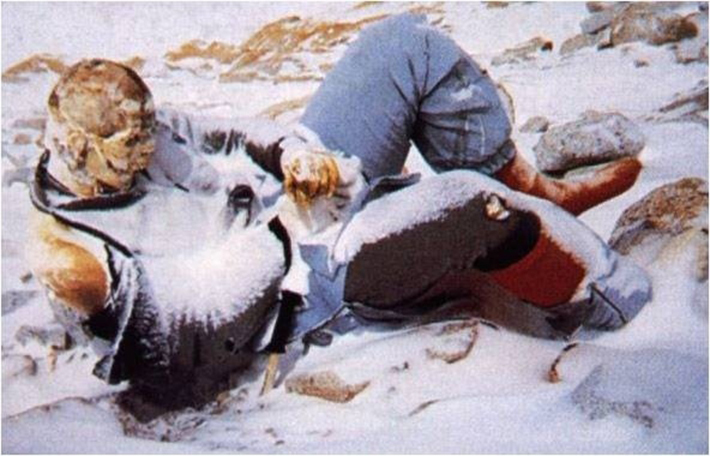 He died during the 1996 Mount Everest disaster. 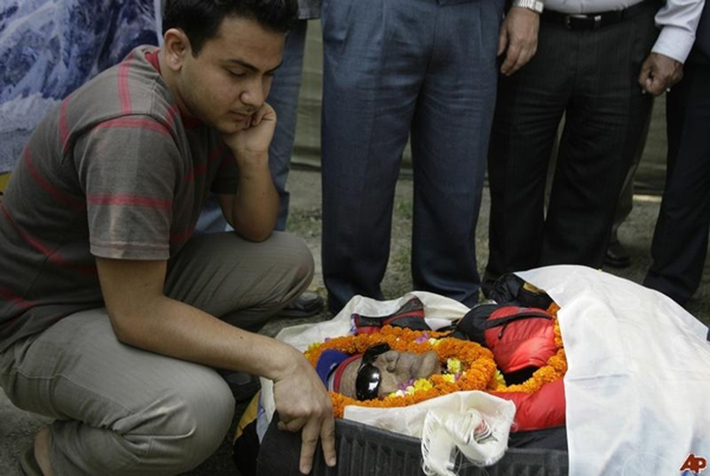 While descending from the summit, he was trapped in a blizzard, and died due to exposure. 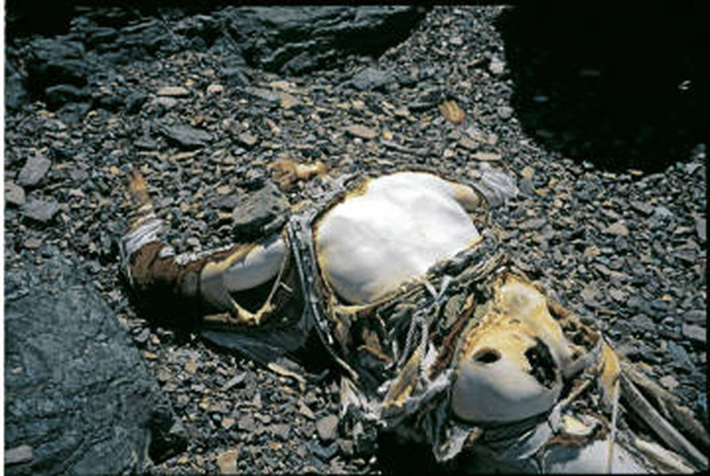 This is the body of George Mallory (cause of death: fall/head trauma), one of the first climbers to attempt to climb Mt. Everest in 1924. Mallory’s body was not found and identified until 1999. He may have been the first person to summit the mountain, but whether he reached the top or not remains a much debated and researched issue to this day. This is Hannelore Schmatz, a German climber who died from exposure and exhaustion in 1979. It is believed she stopped to rest and leaned up against her backpack, leaving the body propped in this unusual way. 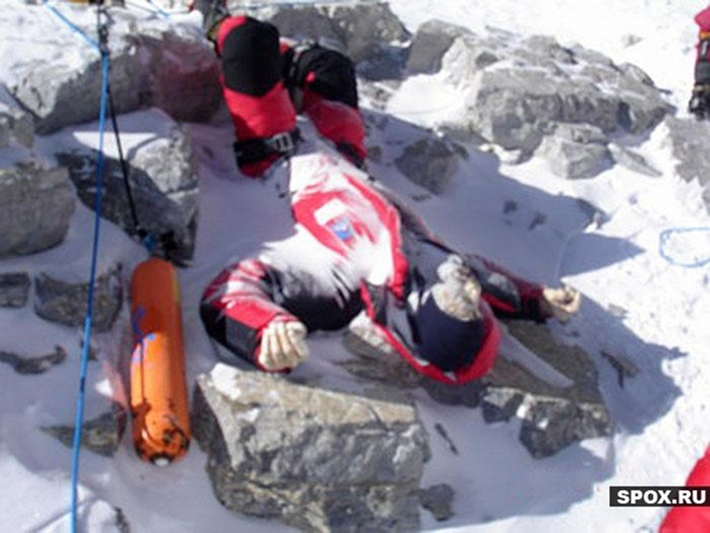 It seems common for the deaths on Everest to occur during a rest or nap; the person falls asleep and never wakes up. Schmatz was the first woman to die on Mt. Everest. Slovenian climber Marko Lihteneker also died from exposure and exhaustion during his descent in 2005. He was last seen having problems with his oxygen mask. His body is 8,800m from the bottom. This is the body of Francys Astentiev (cause of death: exposure/cerebral edema). She was climbing with her husband in 1998 when they became separated. They attempted to search for each other but were unable to reunite. Francys and her husband Sergei both died on the mountain. Apparently, her husband died after a fall and was found a year later. Nobody knows why this body skeletonized. 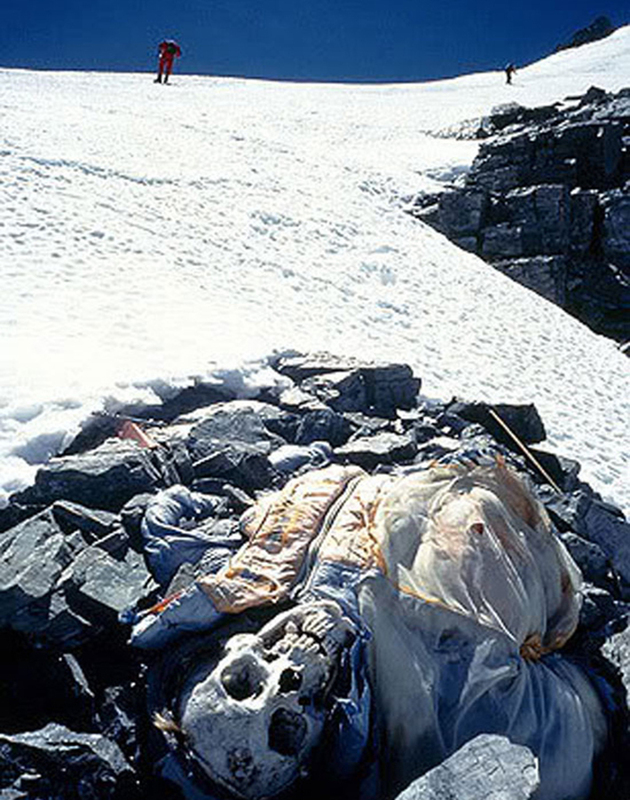 Some climbers often stack rocks and packed snow around the bodies in an effort to protect them from the elements. 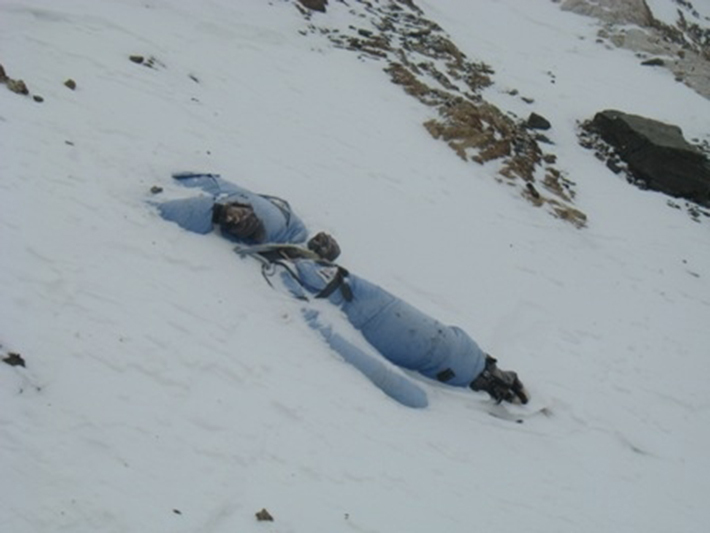 David Sharp was a British climber who stopped to rest near “Green Boots” in 2006. He froze in place and was unable to continue his climb. About 30 climbers passed him on their way to the top and noticed he was still alive. Some even spoke to him. 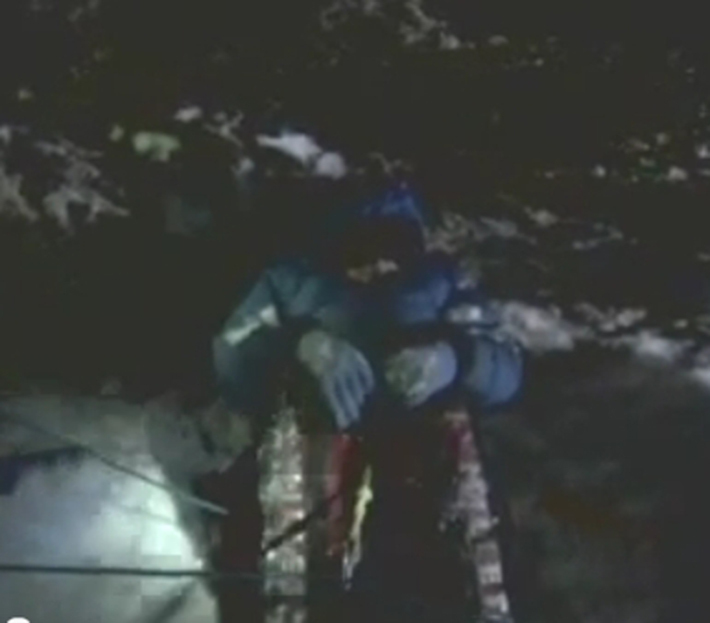 However, on Everest, there is little to nothing you can do to save another life. Attempts to help can likely result in the death of yourself. This is the body of Shriya Shah–Klorfine. 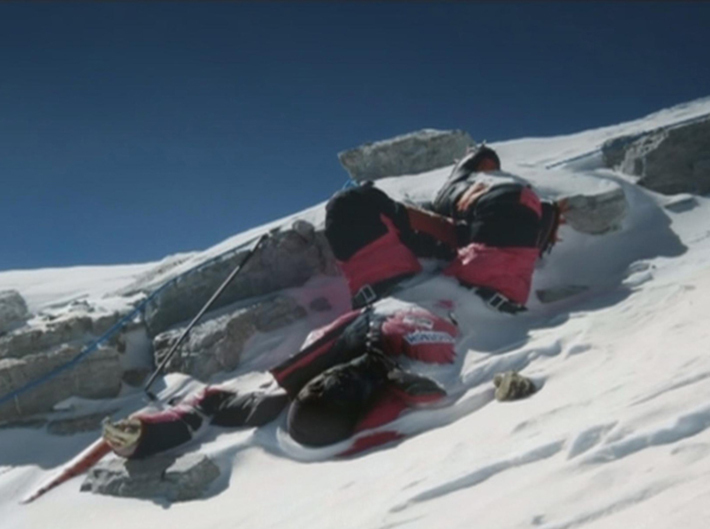 Shriya, who reached the summit in 2012, ran out of oxygen and died from exhaustion because she spent 25 minutes celebrating her victory before beginning her descent. 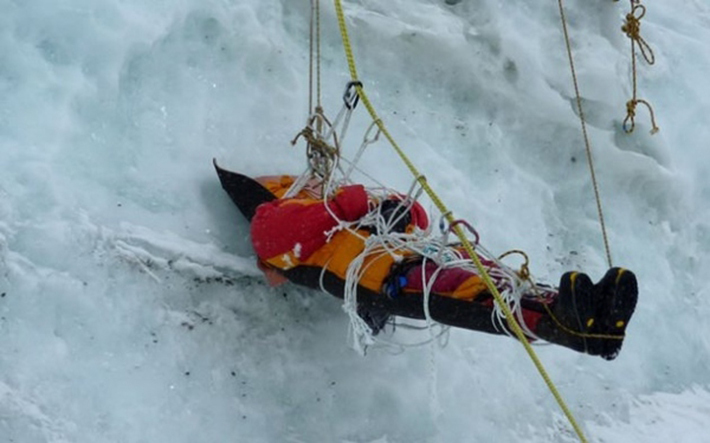 Her body is 300m below the summit, draped in a Canadian flag. Google Earth blacked out secret UFO base at mountain peak of the Himalayas?